There’s no doubt that women have become the dominant consumer group in the U.S. Fast Company estimated, that women control 65 percent of global spending and more than 80 percent of U.S. spending. Their power has buoyed their growing influence in politics, business, and the environment. But women do lag behind in a key aspect of public life, namely the early adoption of technology; especially artificial intelligence (AI). AI is becoming a key part of our public lives as the technology finds its way into more and more real-world applications, like self-driving cars. Bloomberg analyzed the state of autonomous and semi-autonomous vehicles in a May 2018 article. The companies leading the market include Waymo, General Motors Co., and other smaller players. Uber and Tesla are in the testing phase. So why are women proving less likely to adopt the benefits of self-driving cars? And what is the mechanism behind their apprehensive attitudes toward the innovation supporting their developments? We crunched our data on the topic along gender lines in three U.S. states, California, Arizona, and Pennsylvania. These states provide a reliable cross-section of data about their adoption. Silicon Valley is leading the innovation within the industry. Plus, California is generally considered one of the most enthusiastic supporters of new technology. Arizona currently has one of the highest rates of car ownership per household (1.91 as of 2016). Pennsylvania provides an interesting mix of major metropolitan areas, where technically it would be harder to fully integrate self-driving cars, but has powerful rural districts where commercial and private autos would generally be welcomed. 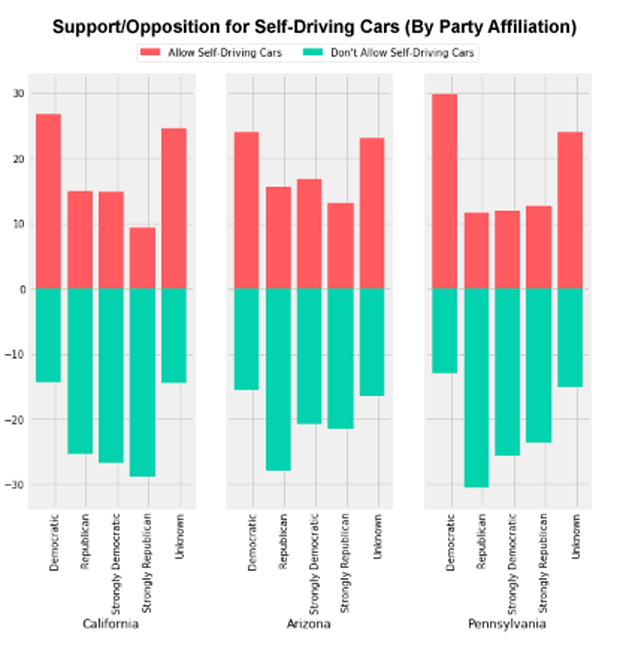 State level case studies showed that in California, men across the political spectrum were more likely to favor self-driving vehicles than women of the same party affiliation. Women lean towards the Democratic party. However, while Democrats tend to favor the technology more frequently than their Republican counterparts, the adoption of self-driving technology has not aligned itself with a particular party affiliation. Instead, it has proven to be a matter of gender divides. Alison van Diggelen, host of Fresh Dialogues, in an interview series that focuses on women and technology, posited that women may disproportionately oppose self-driving cars because they are wary of new, unproven technologies. “The root of women’s risk aversion could be a focus on the downsides, exacerbated by the media’s fixation on fatal (and even non-fatal) accidents involving driverless cars,” van Diggelen said in a statement to us. An article published by Scientific America highlights the lack of comprehensive safety modeling for Artificial Intelligence (AI) technology adaptation into the world of self-driving vehicles, creating an unreliable political agenda modeling for party voters, male and female. Van Diggelen said that not all of her female colleagues express skepticism of self-driving vehicles. One, a design engineer, supports driverless cars because she believes they will ease traffic and save lives. 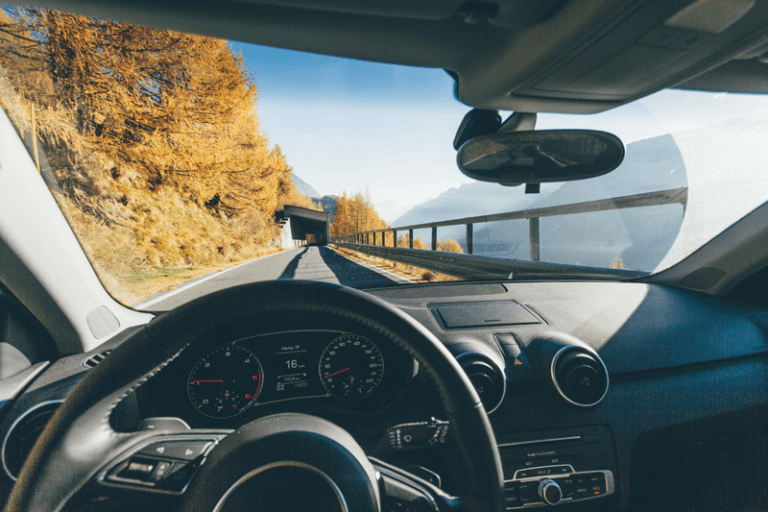 As expectations for the release dates of driverless cars linger in the midst of never-ending competition and AI development modeling, candidates running for office this fall may want to be careful about what positions they take on spearheading self-driving vehicles.